I mentioned in a previous post that we have 2 cleaning regimes , one for when we arrive and the front of the van / windows are dirty from road spray. And another “deep clean” when the van is held back in storage. When I first researched the whole concept of cleaning the outside – lots of owners offered many different opinions on how to get the best results and which products to use. Our van is located on a storage facility, so there is no option for hoses, jet washes or mains hook up. So all the equipment we use we bring along to the storage facility. 2 x 10 Litre spray bottles. And finally we usually have about 30 litres of water – the 2 spray bottles are filled and a couple of 5 litres bottles too. This will be enough water to clean the entire caravan including the roof. Its used by car valets, some car washes and is readily available in many motor accessory shops. It’s a strong cleaner that is sprayed onto the surface and allowed to “soak”. 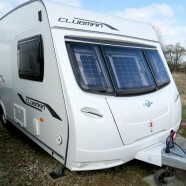 The foam that is produced pulls any grit, stubborn tree sap or black streaks straight off the caravan. One of our 10 litre bottles has a weak Fenwicks caravan cleaner solution. This is what we use to rinse the foam off the caravan and get the panels wet enough to clean. With about 5 litres of water with some car shampoo, we rub the panels down ensuring that the mitten is used clean. We do this by using another bucket of the remaining water that we rinse off the mitten before dabbing back into the shampoo bucket. It’s a technique again that many car valets use – its often referred to the “2 bucket technique” it reduces the risk of scratches ! If you do have small areas where the dirt just will not come off. We use a Magic Eraser to gently remove the mark. These sponges are remarkable, and they do not scratch the surface. The other 10 litre bottle has Fenwicks bobby dazzler in it. We use this to rinse off the caravan and apply that “wax look” to the panels. Using the squeegee to get as much liquid off the caravan as possible. Then use a micro fibre cloth to remove the remaining moisture. We make sure that we only use a cloth on the windows – again to reduce the risk of scratches on the acrylic. At this point the caravan is now spotless. And you can leave it there if you like. But to make life easier next time. We now apply a good coat of Wax. Again we don’t wax the windows (just yet) we use some car polish first to remove the very small swirls and then we apply the wax. Allow the wax to cure before buffing off. With some Micro Fibre clothes. We have a bit of a system. We only work on half a side at a time and between Angela, Tom & Myself we multi tasks and follow each other around swapping between the different roles. We have cleaned the caravan completing all these steps in 1.5 hours between 3 of us. And the times I’ve done it myself – its taken about 3 hours, including a coffee break. If you do decide to clean the roof (and we do every 3rd month) then complete this first. The mess that comes off is quite a big surprise. We use a long handled brush & long handled squeegee to clean and dry the roof.